Towards the south of Tala island are steep rocky walls and strong surge. One site called The End of the World has a sheer wall of black rock that drops to 100 meters deep. There are vast shoals of small fish in the shallows and some interesting invertebrates on the wall. Huge schools of surgeonfish, snappers and some large groupers can be found further down. From September to January high densities of plankton attract many large manta rays that can normally be seen swimming on the surface along the shores and rocks along southern Komodo Island. This dive site is a great place to spot them, drifting is the norm here since currents can be strong. Also spotted on this dive are malabar groupers, potato cod and napoleon wrasse. 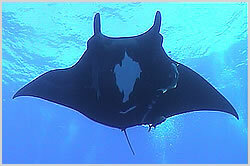 Or Manta Alley is just along from German Flag in the channel that separates Komodo from Tala island. It is a realtively shallow dive to around 20 meters but if the season is right you wont want to stray from close to the surface where the mantas are from November through March. Fish and coral life are abundant and healthy even if there are no mantas.